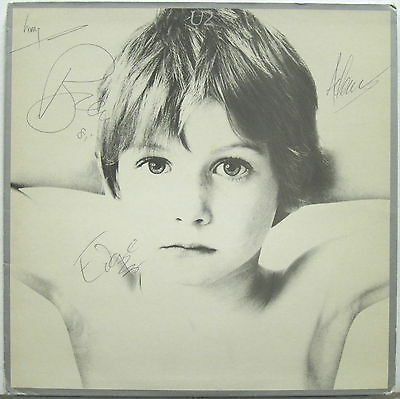 U2 Boy 1980 UK Original LP AUTOGRAPHED By Bono Edge Adam & Larry in 1981 !!! Original rare 1980 Island Records (ILPS 9646) LP, autographed on the front by Bono, Edge, Adam and Larry in 1981. Sleeve is VG condition, some obvious wear from handling, NO splits or damage, rounded corners, incudes custom printed innersleeve, disc is VG/VG+ condition with some light surface marks and spindle marks.